Dallas-Fort Worth Airport is the size of Manhattan and it is true that transit passengers can find plenty of shopping and get a workout just walking between terminals. But if the layover is more than a couple of hours, consider venturing into the city. With new ridesharing services such as Uber and Lyft, getting to downtown Dallas is only $25 each way. The newly revitalized downtown is home to beautiful parks, renovated museums and top-notch restaurants. 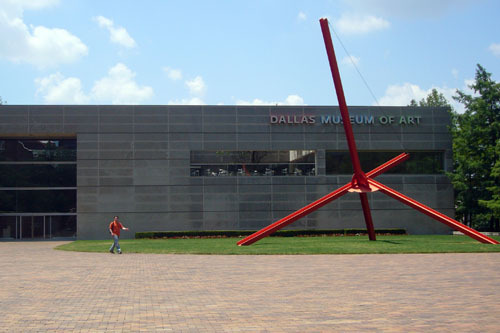 Take in an afternoon at the Dallas Museum of Art, a stroll through the Dallas Galleria or the recently opened George W. Bush Presidential Library. 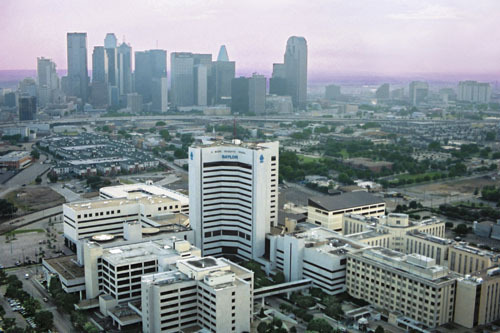 Enjoy a Texas steakhouse or Southwestern specialties before heading back to the airport. The DMA is over 100 years old. It has amassed a rich collection of nearly 25,000 artifacts form ancient to contemporary, including jewelry, sculpture, paintings, pottery and furniture. Some critics claim that the collection is too eclectic but the museum continues to be popular with locals and visitors. Check the website for traveling exhibits of items from other museums and/or private collections. Take the South exit from DFW airport and follow the signs for highway 183 east towards Dallas. 183 eventually merges into I-35E south. After the merger, follow the signs for highways 75/45 which will be a right exit as you near the Dallas city center. Follow this ramp up and left (the only way) over the highway. Take your second exit onto Pearl Street. At the traffic light, turn right on Flora. The museum is visible at the end of the street. 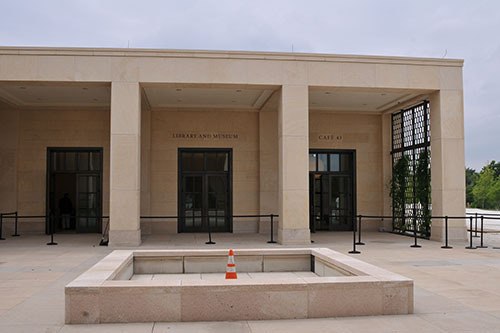 Opened May 1, 2013, the George W. Bush Presidential Library and Museum is our nation’s newest and tells the story of the United States during an extraordinary period in our history. Throughout the entire permanent exhibit, as well as the temporary exhibits, the Museum’s aim is to inform, stimulate discussion, and to encourage engagement. Enter the museum through Freedom Hall. An architectural marvel at a height of 67 feet, the Hall includes a 360-degree, high definition, video wall orienting guests to the exhibit, and depicting a montage of the 44 Presidents. Over 70 million pages of text, audio, and electronic materials are housed in 14,000 square feet of space located adjacent to the SMU campus. The museum includes exhibits on education reform, the global war on terror, the U.S. financial crisis, and efforts to combat the spread of HIV/AIDS. Look for a piece of steel from the World Trade Center, a re-created full-sized Oval Office, and a Texas Rose Garden. 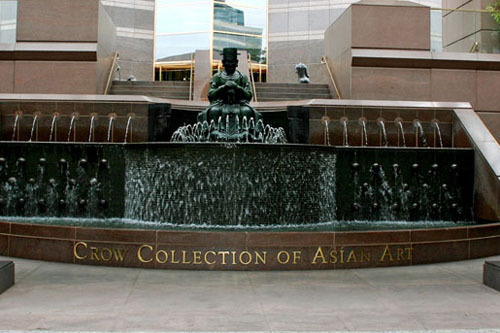 The Crow collection is dedicated to the arts of China, Japan, India and Southeast Asia. For 30 years, real estate giant Trammel Crow and his wife Margaret amassed this phenomenal collection of Asian art. 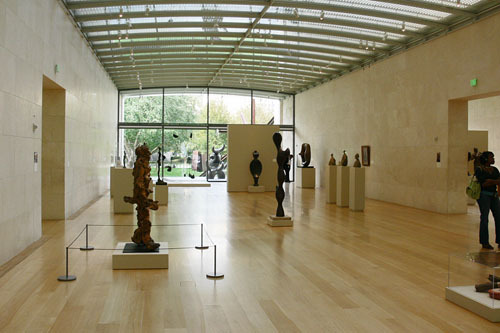 More than 300 paintings, sculptures and artifacts in this private collection are museum quality. The Crown's 1,200-piece Chinese jade collection is featured, along with second-largest impeccable crystal ball in the world. Some ancient items date from 3,500 B.C. In the Trammel Crow Center garden above the museum, find renowned statues such as Rodin's Genius of Eternal Rest, Maillol's Nymph With Flowers and Bourdelle's Horse for Alvear Monument. Use either the North or South exit from DFW Airport and head for Dallas. From the South exit follow Highway 183 East to Dallas. From the North exit, follow Highway 114 East through the attractive business community of Las Colinas. Highways 114 and 183 merge at the Dallas Cowboys' current stadium in Irving. Continue east. Highway 183 becomes I-35E. After Market Center, begin to keep right. Follow the signs for Highway 75 / 45 which will take you onto a ramp up over the highway. Take the second exit, Pearl Street. The Asian Collection is on the right at the first traffic light. There is a parking lot at the intersection. Or park for free for two hours in the Crow building underground garage. The Raymond and Patsy Nasher Collection started more than fifty years ago and includes items from a few inches tall to towering pieces of sculpture. The museum and gardens include works by Jean Arp, Henry Moore, Barbara Hepworth, Joan Miró, Alexander Calder, and one of the most recent additions to the collection, Jonathan Borofsky's exciting "Walking to the Sky" (2004). Use either the North or South exit from DFW Airport and head for Dallas. From the South exit follow Highway 183 East to Dallas. From the North exit, follow Highway 114 eEast through the attractive business community of Las Colinas. Highways 114 and 183 merge at the Dallas Cowboys current stadium in Irving. Continue east. Highway 183 becomes I-35E. After Market Center, begin to keep right. Follow the signs for Highway 75 / 45 which will take you onto a ramp up over the highway. Take the second exit, Pearl Street. The Nasher Sculpture Center is on the right at the first traffic light. There is a parking lot at the intersection. Closed July 4, Thanksgiving Day, December 25 and January 1. Giant shopping malls offer Dallas-style shopping experiences. And the Galleria is an experience that goes way beyond shopping, a destination unto itself. Those “everywhere” malls usually have the same stores over, and over again. Not the Dallas Galleria. From jewelers such as Bachendorf’s and Tiffany & Co. to fashion purveyors Saks Fifth Ave., Nordstrom and Armani Exchange, Dallas Galleria allows you to find everything you want for yourself, for your home or for gift giving. With three floors and hundreds of shops, boutiques and department stores… if you can’t find it at The Dallas Galleria, you don’t need it. The Galleria is also a dining destination. No, not another ubiquitous food court, there are over 35 dining spots at the Galleria. And more than a half dozen of those are full-service, fine-dining establishments. Yes, there is entertainment! Check out the Galleria’s event calendar to find fashion shows, sculpture competitions, musical acts, magic shows, and more. The winter holidays are a very special time to visit with concerts, food samplings and seasonal decorations. But wait, there’s more! 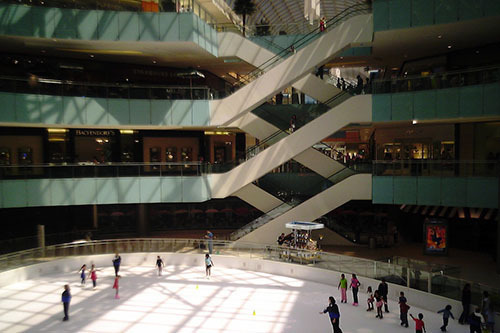 The centerpiece of the Dallas Galleria is the indoor skating rink. From Michelle Kwan-wannabe’s to those who are just out for a bit of exercise on the ice, the perfect conditions on this indoor rink will have you gliding along in no time.